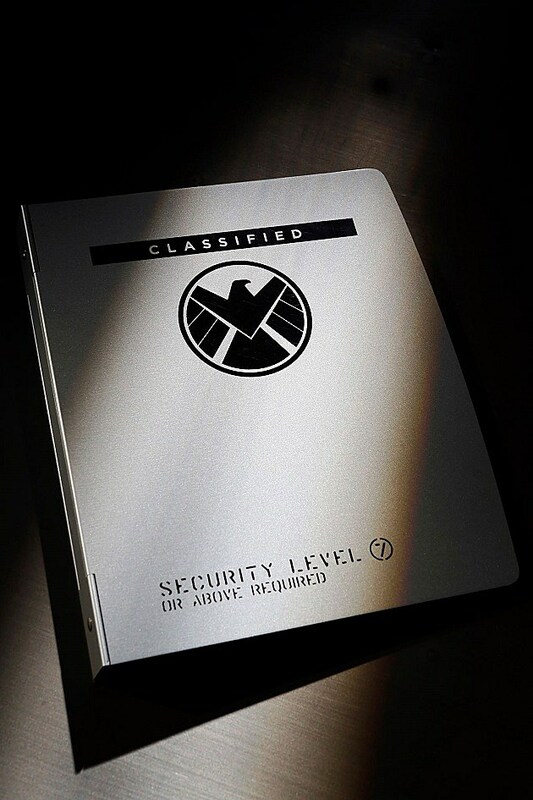 Comic-Con 2013: Marvel’s ‘Agents of S.H.I.E.L.D.’ Teaser Image Is Classified! Marvel's 'Agents of S.H.I.E.L.D.' will officially debut to the world this coming Friday with its Comic-Con 2013 panel, but eagerly anticipating fans of the Joss Whedon-directed ABC series needn't wait that long for a new unclassified look. A new Comic-Con 2013 teaser image for Marvel's 'Agents of S.H.I.E.L.D.' has hit the web, so what can we gleam from the top-secret documents glimpsed? You guessed it! A flat nothing. Like the blacked-out teaser billboards that have cropped up around the country, the latest teaser image from Marvel's 'Agents of S.H.I.E.L.D.' keeps things very much on the down-low, highlighting a "Level 7" binder that speaks to the secrecy inherent to the series. That secrecy was recently revealed to be so prevalent, even Agent Coulson himself doesn't know the circumstances of his return from the grave! While we wait for this week’s Comic-Con panel, Marvel’s ‘Agents of S.H.I.E.L.D.’ features a cast that includes Clark Gregg’s resurrected Agent Phil Coulson, as well as Whedon vet J. August Richards, ‘ER’ doc Ming-Na as veteran agent Melinda May, Chloe Bennet as hacker Skye, Brett Dalton as Agent Grant Ward, and Elizabeth Henstridge and Iain De Caestecker as science team Gemma Simmons and Leo Fitz. Nick Fury himself, Samuel L. Jackson, previously stated that he expected to be involved in some small capacity, while ‘How I Met Your Mother‘ and ‘The Avengers‘ star Cobie Smulders remains open to the possibility. Even Sam Rockwell is game to reprise his ‘Iron Man’ role of Justin Hammer, by his own word. Rumors suggest that the entire 'Agents of S.H.I.E.L.D.' pilot will run at Comic-Con this Friday, and we'll be on hand for the report. In the meantime, check out the mysterious teaser image below, and tell us what you most want to learn from the hush-hush new superhero series!